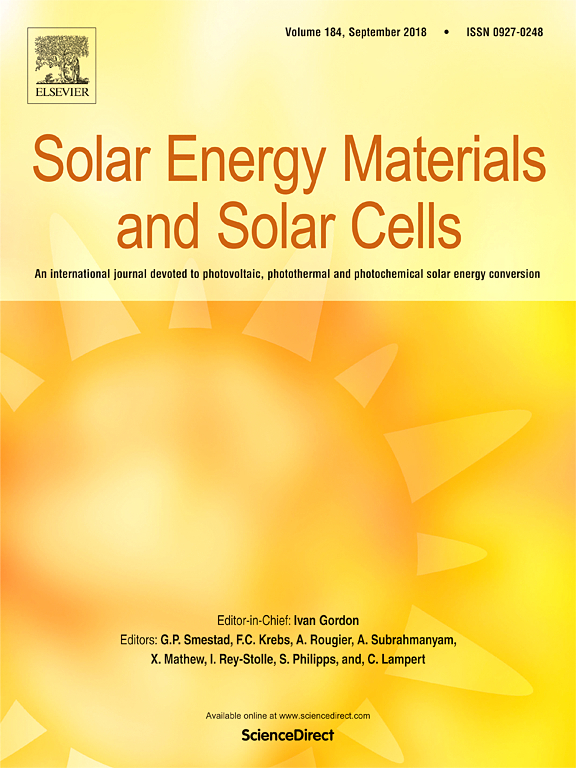 UPDATED: Elsevier retracts a paper on solar cells that appears to plagiarize a Nature journal. But the reason is…odd. The similarities between recent papers in two different journals about energy were striking — so striking that a number of people have taken to Twitter and Facebook to let the world know about them. Perovskite solar cells have achieved power-conversion efficiency values approaching those of established photovoltaic technologies, making the reliable assessment of their operational stability the next essential step towards commercialization. Although studies increasingly often involve a form of stability characterization, they are conducted in non-standardized ways, which yields data that are effectively incomparable. Furthermore, stability assessment of a novel material system with its own peculiarities might require an adjustment of common standards. Here, we investigate the effects of different environmental factors and electrical load on the ageing behaviour of perovskite solar cells. On this basis, we comment on our perceived relevance of the different ways these are currently aged. We also demonstrate how the results of the experiments can be distorted and how to avoid the common pitfalls. We hope this work will initiate discussion on how to age perovskite solar cells and facilitate the development of consensus stability measurement protocols. Yes, those abstracts are identical, and the pattern continues throughout the papers. I was more surprised even than angry that this kind of thing can happen in the digital era and also in a respectable journal. No need to mention that my opinion of Elsevier as a publishing house and of scientific publishing culture more generally has suffered. We’ve asked Zaeem Aslam, the corresponding author of the Solar Energy Materials and Solar Cells paper, to explain the similarities, and will update with anything we hear. In this particular case, the first author of the SOLMAT paper claimed that the results were his and that in fact his results were stolen during a prior peer review and then published in Nature Energy before he had the change of publishing them in SOLMAT. Obviously we did not believe this, but still we were bound to give the first author the chance to proof this accusation, which of course he could not. Now that we have given him ample time to defend himself, which he could not do satisfactorily, we are retracting the paper and will make sure the involved parties get punished by their own institutes. Of course this paper should never have been published in the first place. We are fully aware of that and humbly apologize for this. Neither the editor in charge of the manuscript nor the three reviewers that reviewed the paper noticed that this was just a copy of an existing paper. I have taken internal measures to make sure that such a case cannot happen a second time. This retraction notice is a very unfortunate typesetting error and will be replaced with the correct notice later today. Our abject apologies to the authors of the original paper and to readers. Update, 1640 UTC, 8/30/18: The retraction notice has been updated. This article has been retracted at the request of the Editor-in-Chief and Authors. This article plagiarizes a paper that had already appeared in Nature Energy volume 3 (2018), 61–67 10.1038/s41560-017-0060-5. One of the conditions of submission of a paper for publication is that authors declare explicitly that their work is original and has not appeared in a publication elsewhere. As such this article represents a severe abuse of the scientific publishing system. The scientific community takes a very strong view on this matter and apologies are offered to readers of the journal that this was not detected during the submission process. I made a single sample among the Lahore authors’ work: This sentence “While residential PV use began with direct-DC in off-grid …” I found in https://eta.lbl.gov/sites/all/files/publications/catalog_of_dc_appliances_and_power_systems_lbnl-5364e.pdf (page 1, page 13 in the PDF, second paragraph, October 2011) and it is copied to http://journals.sagepub.com/doi/pdf/10.1177/0958305X18763403 (page 2, second paragraph) which the authors published in 2018. First sentence in first paragraph on the page has also similarities. I haven’t looked further. DC appliances” referred to above has the corresponding email with one “1” in the gmail account, i.e., different from the article in “Solar Energy Materials and Solar Cells”. Journals generally don’t like being involved in misconduct by authors and cases like this, so they follow a path to make the victims tired and the process costly for them (through wasting their times), so forgetting about following up the plagiarism. I have this kind of experience. It is shameful. As the email addresses are different, the case is somewhat strange. This could be a case of identity theft. Whether the institutions where authors are working are informed? Many journals contact other putative authors of a paper before publication, to inform them (and to confirm that they are not just being used for camouflage). Is that general Elsevier policy? I wonder if plagiarism test was not run on the paper prior to reviews. And I think this is not a problem of the Journal platform but that of the editor in chief of that particular journal. He should have averted this situation of plagiariat has been Conducted before reviews. This is a crime done by the authors and also show negligence of the editors of the journal. This is a very shameful act in the academia. Those involved must be penalized and set a precedent to avoid such acts in the future. Can someone help me understand – is it that difficult or time consuming to run the plagiarism detection software? The reason I’m asking is that the time Elsevier will need to invest in this case will likely be significant. Doesn’t the benefit running detection software (i.e., avoiding time wasted in investigations after the fact), outweigh the time needed to run the software. I’ve never used plagiarism detection software & don’t have a sense of whether it’s quick & easy. There are many online softwares (database engine) that do it in 1-5 min. e.g. Turnitin and Ithenticate websites. But need academic or paid subscription. Plagiarism (text) up to 19-25% is allowed fro 1 document. But a paper word by word from start to end including same figures (data) is completely not allowed. Elsevier should revisit their plagiarism check policies and methods. Editorial role and acceptance procedure in this regard is highly questionable (not less than shameful). Elsevier uses plagiarism detection software that picks up even small similarities and overlaps in text, and the editors are told to use it during training sessions. Strictly speaking, the associate editor and referees of the paper would have been responsible for picking up on this. However, the editorial + peer review process is more focused on content rather than catching stuff like this. Instead of blaming the journal, editors and reviewers it would be better to question the author who submitted the paper in the first place. You can’t simply put the guilt on the authors and expect them to behave ethically. People will misbehave. There’s no way to stop this in the short term. Elsevier and other publishers MUST find a way to stop this, maybe even employing teams of people who run preliminary checks on submitted research, involving plagiarism detection and letting the editor in charge know about possible issues BEFORE peer review. A shameful act by corressponding author, he should be black listed upon such act. It is a crime and the authors must be punished. The institution, UET Lahore, must take a punitive action against these authors and may set an example for the other to refrain from such activities. Elsevier should have done the similarity index to stop such publications. It is a shameful act of the involved researchers who are responsible in bringing bad name for the premier institution; UET Lahore. The scientific research is governed by the ethics only, so the major blame goes to the authors of the Solar paper. This is a big and unacceptable mistake at all. The Solar journal has some responsibilities also, but since Nature paper was published in Jan. 2018, and the Solar paper was submitted in Mar. 2018, so it might be checked by Palagorisim software and nature one was not detected on that early time ( I have such experience). Now is not the time of the blame, it is a time of taking action. Solar journal (and Elsevier) must take fast and strong action by withdrawing the paper and bloke listed the authors. The wrong email issue, it could be confirmed by checking the IP address of the PC from which the paper has been submitted. Again fast and strong action must be taken by Elsevier. This is a crime for research community. 99% is copied only the title is change!!! This kind of irresponsibility and fraud must be dealt with appropriately so that these authors are punished accordingly and others also understood the gravity of such cheap and defaming other colleagues as well approach. They may have to retract the retraction. Has anyone informed them that the earlier article was by *different* authors? Typesetting error?!? Oh please, this is literally what you are about as a publishing company. I have a tool to compare files. No doubt about the plagiarism here. Want to see the results? I think editors of the journal are more responsible than the authors. Previous Previous post: Hello, reviewers? How did a study manage to say it was randomized, but also that it wasn’t?